China’s money-market liquidity squeeze is about to get worse. The benchmark seven-day repurchase rate will average 2.65 percent in the first quarter, up from 2.47 percent in the current period and the highest since the start of 2015, according to the median estimate in a Bloomberg News survey of 24 bond traders, investors and analysts. More than half the respondents are expecting a record selloff in China’s $7.9 trillion debt market to last until at least the end of March, with the government’s deleveraging push and tighter monetary conditions looming as the biggest risks. 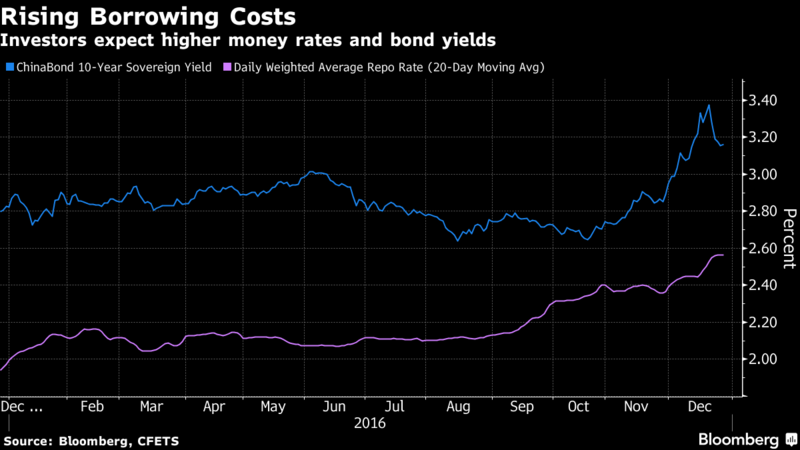 The average interbank repo rate surged to a 20-month high on Dec. 16 on a combination of year-end cash demand and mounting concern over counterparty risks after a brokerage reportedly declined to honor its bond trading agreements. China’s debt market is heading for its biggest monthly decline in at least a decade, ending a record bull run that had been in place since the beginning of 2014 as investors bet the People’s Bank of China would keep financing costs low to bolster the economy. While the PBOC’s benchmark policy measures don’t signal a change in that stance — interest rates have been on hold for more than a year, and reserve ratio requirements for lenders were last lowered in the first quarter — the central bank has been using other measures to drive up the cost of money in China. The benchmark seven-day repo rate jumped 15 basis points to 2.72 percent on Thursday, the most in eight months, according to weighted average prices from the National Interbank Funding Center. The cost of borrowing for two weeks surged 86 basis points to 4.46 percent, the most in two years. The monetary authority started injecting longer-term funds into the financial system in August, which carry a higher interest rate. The PBOC stopped offering three-month loans through a separate facility the same month and is favoring one-year debt instead, while saying it will “proactively” contain asset bubbles and financial risks. All bar one of the respondents in the Bloomberg survey said liquidity will be “tightly balanced” or “tilt toward tight” next year. One-third of the respondents predicted the central bank will raise the interest rates used in reverse repo operations in the first quarter, according to the survey conducted Dec. 22-26. The cost of one-year interest-rate swaps, a gauge of market expectations for the benchmark seven-day repurchase rate over a year, is heading for the biggest quarterly advance in three years, jumping 80 basis points since the end of September to 3.35 percent. That’s higher than the 10-year sovereign yield at 3.12 percent on Wednesday, ChinaBond data show. The participants in the Bloomberg News survey included China Merchants Bank Co., China Guangfa Bank Co., HFT Investment Management Co., Genial Flow Asset Management Co., Mao Dian Asset Management, and Nanhua Futures Co. Eighteen traders, investors and analysts asked not to be identified as they are not allowed to comment on the matter publicly.